Roaming through retirement these past six years have been filled with thousands of wonderful experiences. The people, the events, and the sights and sounds have been extremely satisfying. Documenting these rich experiences and sharing them with family and friends through this website is one way we create a meaningful contribution to life. February is yet another example--hope you enjoy! 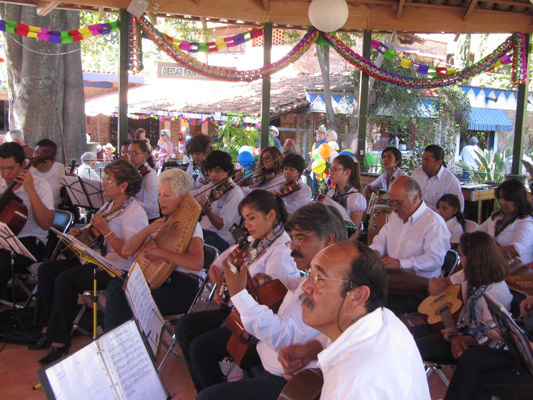 Youth and elders alike make of the Orquestra Tipica de Chapala which was the main attraction for the Fiesta Latina. 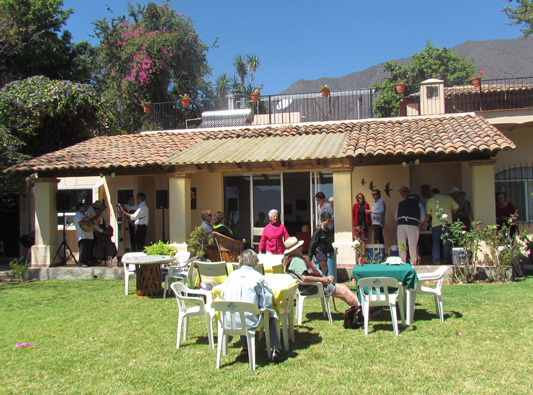 This event hosted by the Lake Chapala Society raised 100,000 pesos for their Community Education Programs. Hosting small dinner parties is our way of bringing friends together for an evening of good food, wine and conversation. This was a two-table dinner party. Pictured are Carolyn, Ross, and Kelly. Living in a retirement community means having to say farewell to friends who have reached the end of their life. This portrait of Mary was done by a local artist which, was displayed at her memorial celebration. 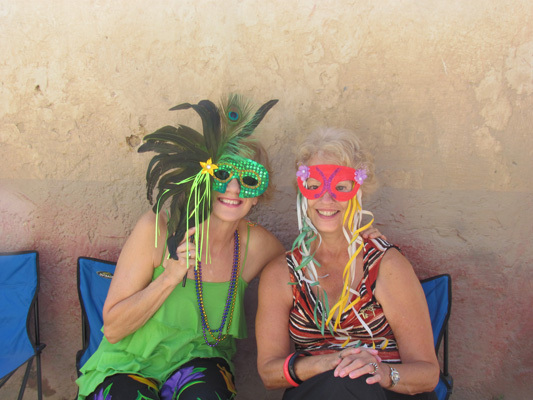 Call it Fat Tuesday, the Car-na-vall, or Marti Gras--is another reason to get together, dress up, and enjoy the fun times. Glorine and Carolyn are sure having fun. 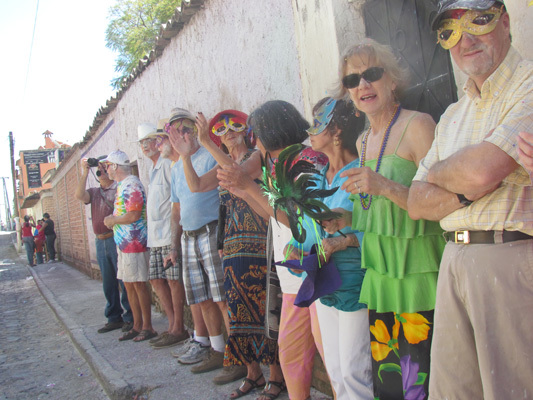 Ajijic is one of many cities and villages throughout the world that makes Marti Gras a special experience. 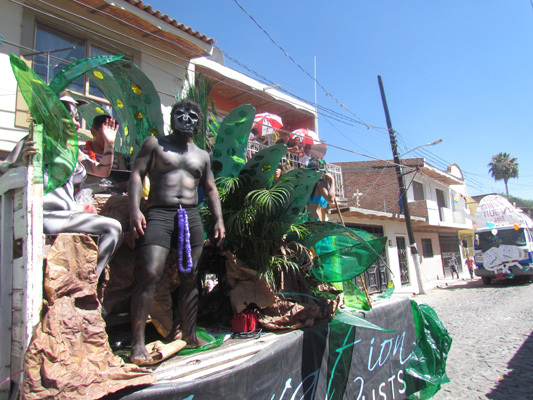 Here is one of many floats in a parade down one of the main streets of the village. 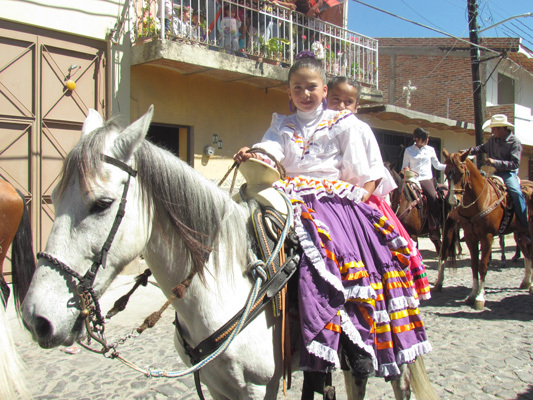 These two little cuties on horseback sure enjoyed posing for this picture. 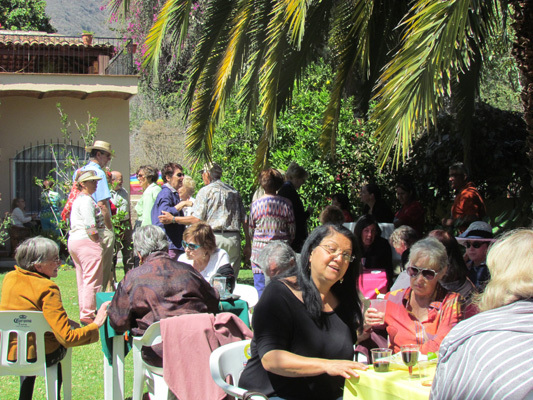 Here are just a few of the many people invited to a great brunch hosted by friends Phil and Mary. Their home is on the parade route and as you can see, most of us showed the remnants of having been splattered with flour, a ritual of Ajijic. 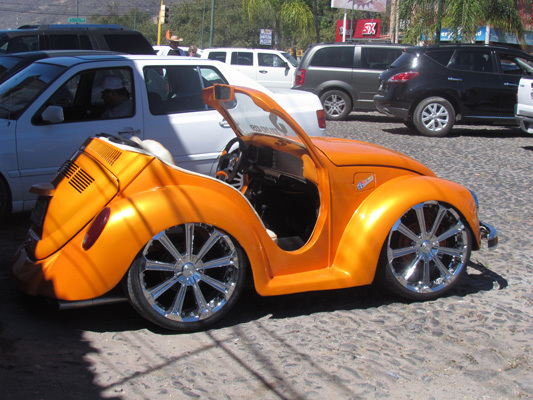 We found this VW very interesting--as if it is not small enough to begin with! 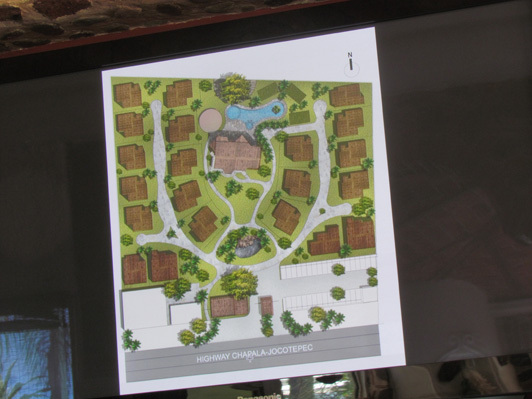 We visited this proposed "Sustainable Intentional Community" near Ajijic. This is a great idea for us "hippies" who didn't have a chance to live in a "commune" when we were young--this one is a bit more upscale then those back then Across the street from the cohousing project is several large green houses, primarily used to grow organic blackberries. However, people living there have access to one of them as a community garden. 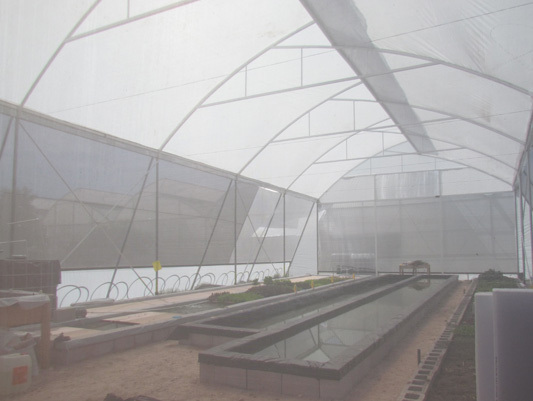 This one is for hydroponics. Ah, back in California to spend time with the kids and grandkids. February means it is Hunter's birthday. Craig and Chase flew out early from MN to help celebrate. Unfortunately, Denise and Clara could not get a flight out! 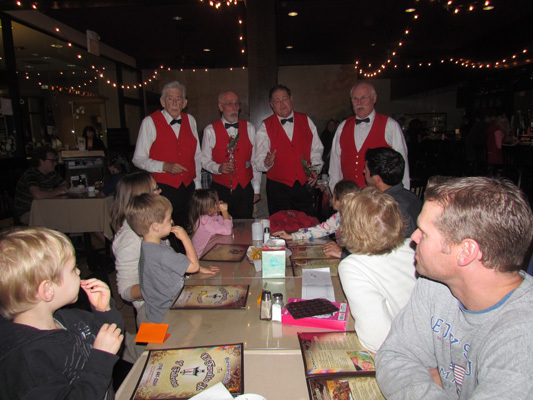 We went to a local restaurant to celebrate Valentines and Mike surprised everyone by having this Barbershop Quartet come and serenade the family. 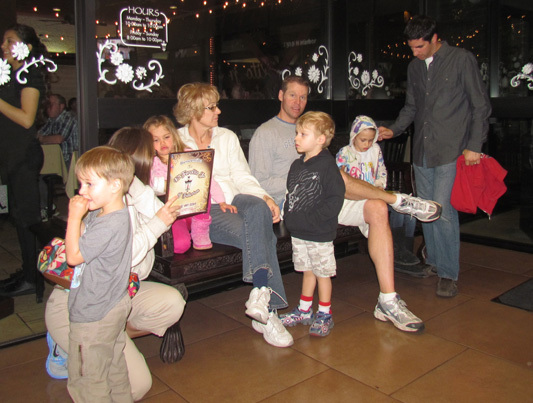 Other diners joined in on the sing-alongs. 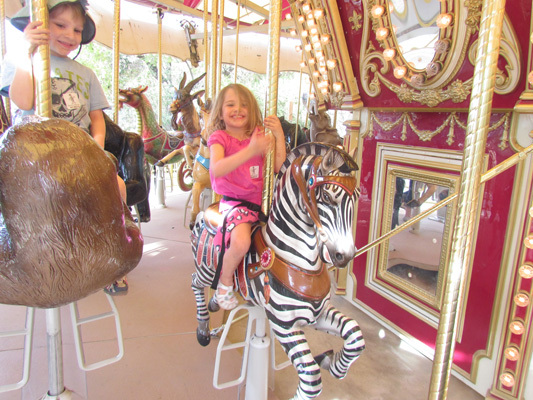 Carmen has a family pass at Santa Ana Zoo at Prentice Park not far from their home in Fullerton. While small, it is very diverse. 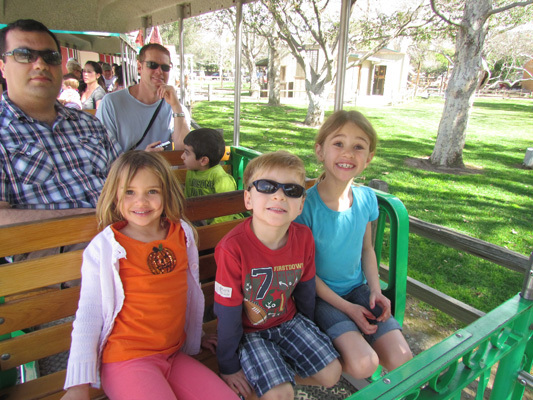 The kids are enjoying the ride. 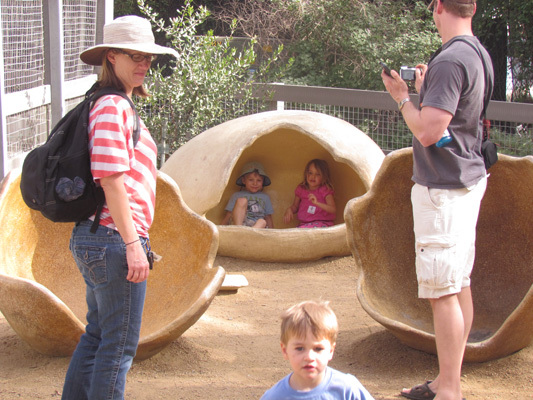 With all the other things to do, it is hard to believe how much fun the kids had playing in these dinosaur eggs. 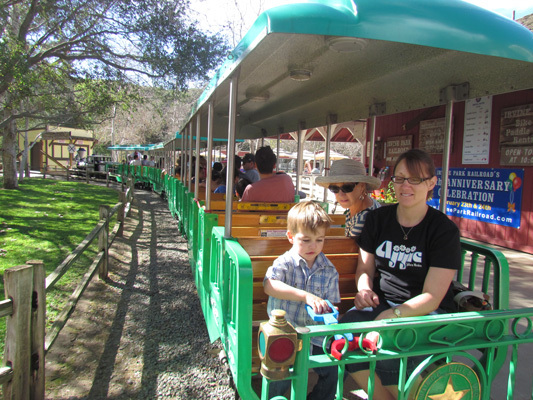 With Hunter's obsession for trains, we celebrated his birthday at the Irvine Regional Park with this 1/3 scale train that meanders through the foothills of Orange County. Sierra, Chase and Dakota ran to get front seat. Hunter decided he wanted to be in the very back seat. For a three-year old, he is very independent with pretty firm convictions. We guess it beats the alternative. 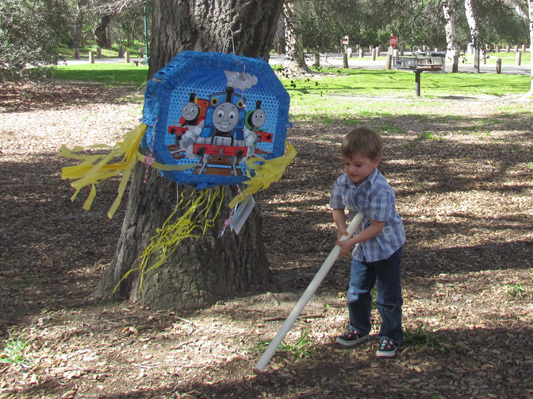 Being that it was his birthday, Hunter got to take the very first swing at the piñata. Eventually all the work produced hands full of chocolate candy. Hmmmm! Happy faces for a happy boy on his happy birthday. Life doesn't get any better than this. Irvine Park is a 160-acre oak grove that was donated to Orange County back in the late 1800s. 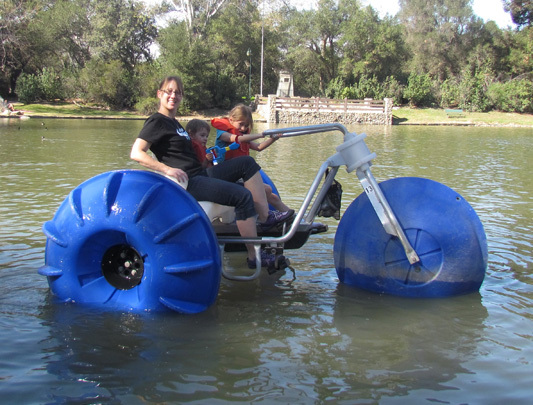 We rented a couple of paddle boat to do a little sightseeing and work off those extra calories we just put on. 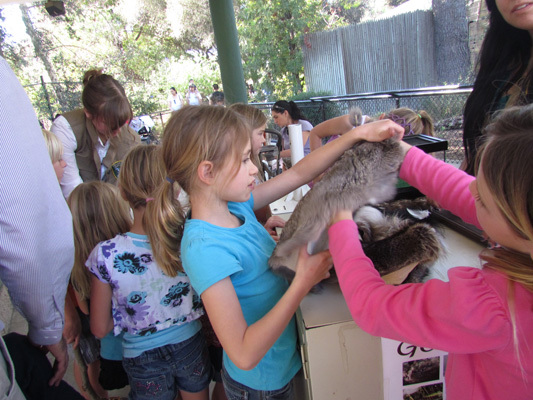 Irvine Regional Park is home of the Orange County Zoo that focuses on animals and plants native to the southwestern United States. Dakota was fascinated by the feel of different wild animal furs. Prepping for yet another birthday party for Hunter. 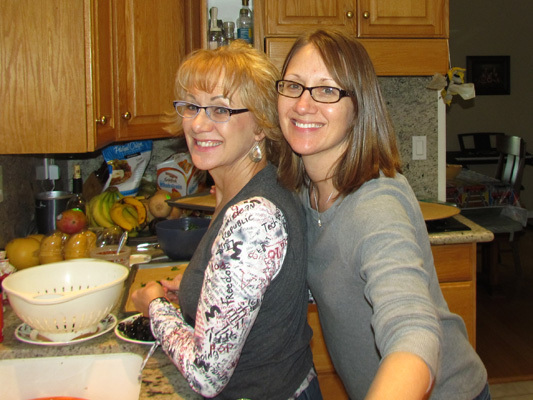 In addition to being a professor of optometry, Carmen is a great cook. Like Mom like daughter. 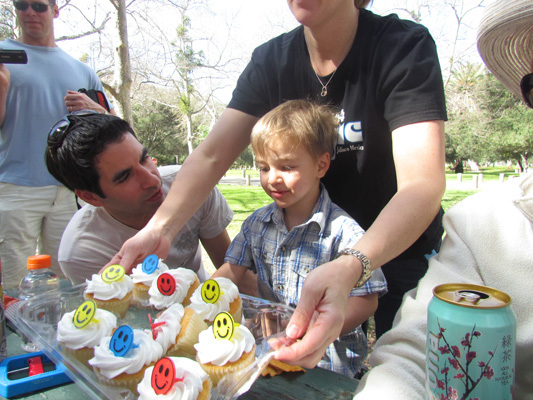 This is not just another cake, it is a Thomas the Train cake. 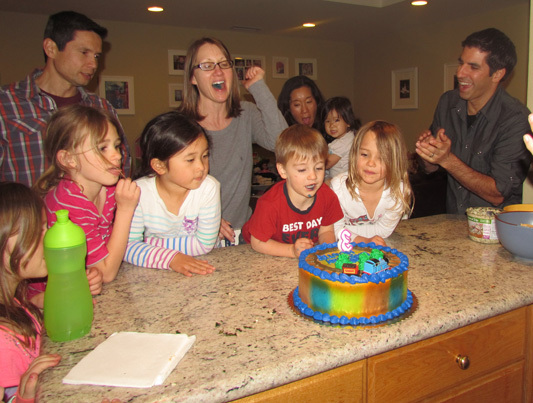 Happy Birthday to you--quick, blow out the candle so we can get to the chocolate. The three amigos. 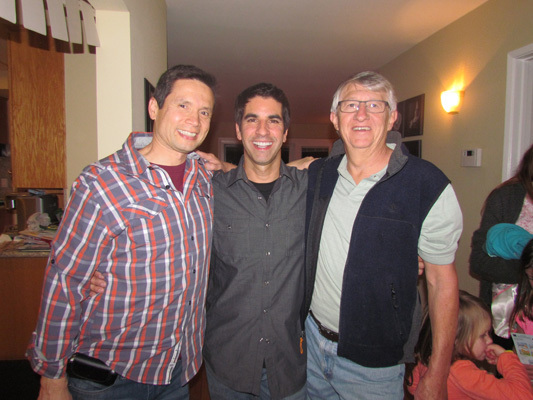 While in California, Larry typically joins Mike and his buddy Jon for a "boy's night out." Jon has a couple of daughters that love to play with Dakota and Sierra. 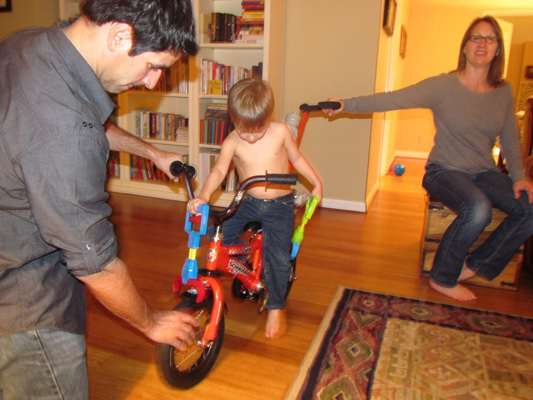 Finally Hunter got a bike of his own. Up to now, he used the girl's hand me down bike, which wasn't bad, other than they were Pink! 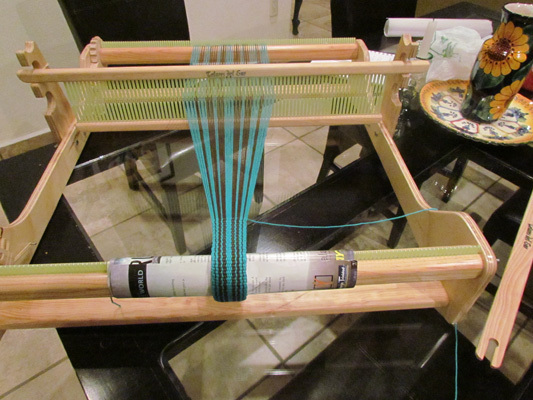 As if Glorine does not have enough to do, she decided to take up weaving. She bought this new portable loom and is taking lessons from a local expert. This project is a new belt that Glorine will add to her collection. 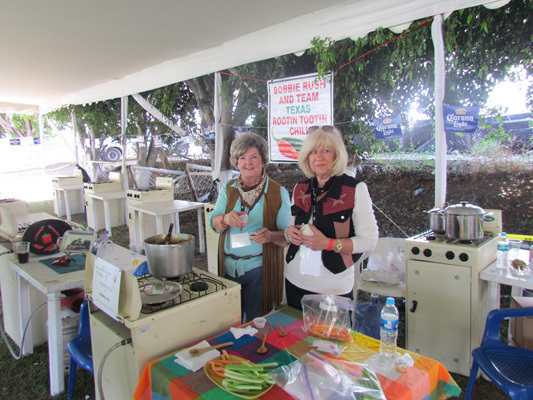 The weather could not have been better for the 35th Annual Chili Cook-off. This three day event is the 'biggest' fundraiser conducted at lakeside, which benefits five well deserving non-profit organizations. 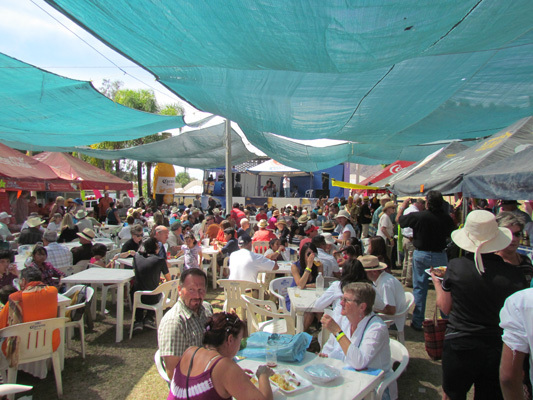 With 7,000+ people taking in the annual cook-off, over one hundred vendors set up to display and sell their various wares. 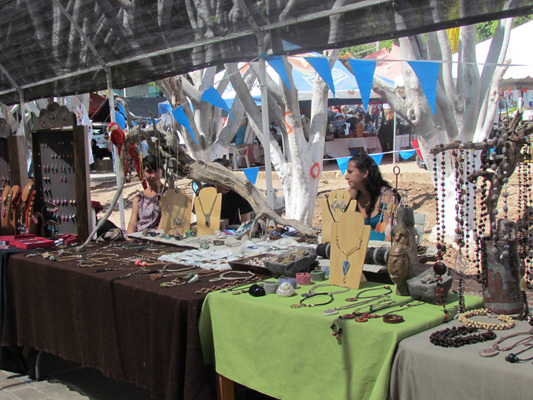 Vendors include great food and libations. 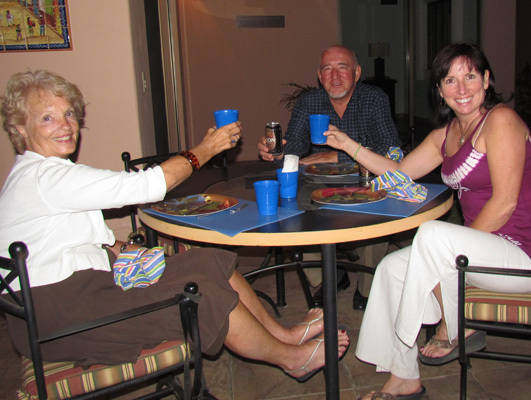 Here friends Greg, Kelly and Carol are among hundreds taking in the great entertainment. 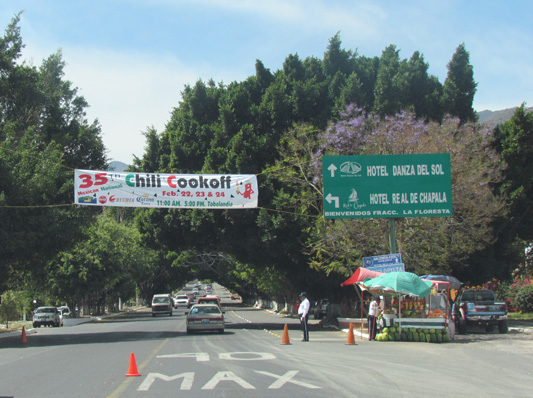 For ten pesos (equivalent to 80 cents) you get to sample and vote for the best of ten different chili recipes. Some were toooo sweet, some were tooooo hot, and some are just right. This year, the Academy Awards became another excuse for another great get together. Here are just a few of our friends who got all decked out. This local pub, with large screen TVs, rolled out the RED CARPET (really). Fun, fun, fun! 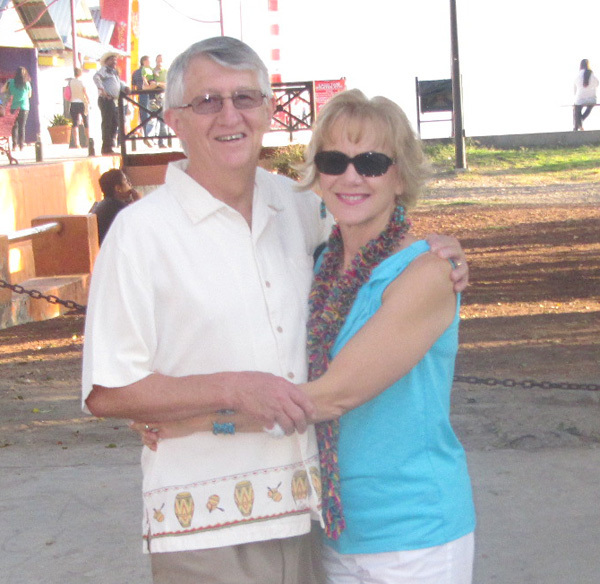 Friends Alan and Carol Bensman from Minnesota hosted one last fund raiser in February. 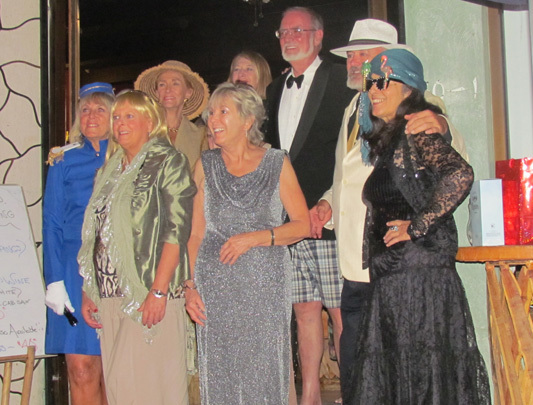 They opened their beautiful lake-front home to nearly a hundred people for yet another great cause. 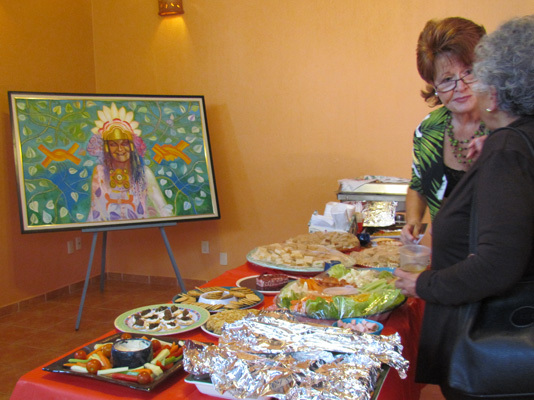 This event highlighted the work of Sylvia Flores, who spent 30 years providing education and medical services in the areas of women's health and social issues, family planning and pre-marital education to young Mexicans.